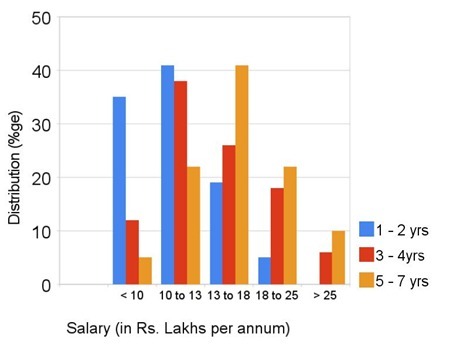 What salary do MBA’s from Premier Business Schools in India get? 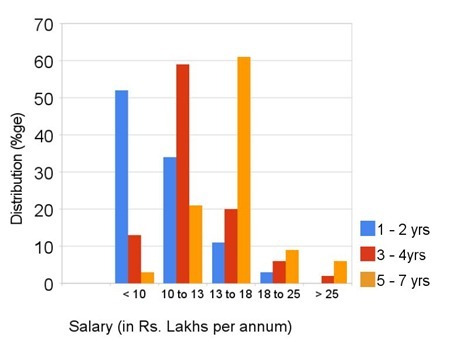 Here are some of the figures from the survey conducted by iimjobs.com – These numbers were collated based on salary data administered between May 16 to 31, 2010 with over 5600 MBA graduates sharing their salary data anonymously. Salaries grew fastest at 12.7% for professionals working in IT sector, taking them closer to their batch mates working in Finance and Consulting. 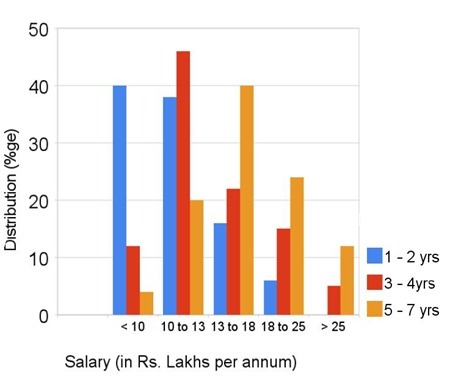 Average salary for MBAs working in IT sector was observed to be 12.9 lakhs for 3 to 4 years of experience and 17.3 lakhs for 5 to 7 years of experience. Professionals in Sales & Marketing saw 11.8% growth in compensation this year. Average salary for MBAs working in Sales & Marketing was observed to be 9.8 lakhs for 1 to 2 years of experience, 13.6 lakhs for 3 to 4 years of experience and 18.1 lakhs for 5 to 7 years of experience. Average salaries in Finance was observed to be 11.5 lakhs for 1 to 2 years of experience, 14.3 lakhs for 3 to 4 years of experience and 19.6 lakhs for 5 to 7 years of experience. Average salaries in Consulting grew around 7.6% and was observed to be 11.5 lakhs for 1 to 2 years of experience, 14.7 lakhs for 3 to 4 years of experience and 18.4 lakhs for 5 to 7 years of experience. 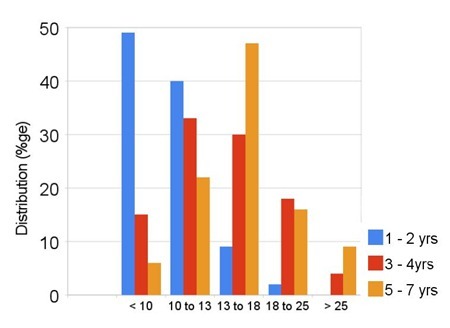 Attrition rate was observed to be highest at 13.6 % for Finance graduates with 3 to 4 years of experience. It was lowest at 6.9% for professionals in General Management/Consulting. Average Attrition rate was 11.2%. For iim’s u have to pass their entrance exam called CAT. tell me actual creteria for joining iim please also tell which is best sector in MBA as I m pusuing BBA. You need to appear for CAT(Common Admission Test) to be able to get into an IIM. This is anuj kumar. I did my Mba in 2008-10 from a low grade college. now at the placement time m strugling for the good compny as well a good pkg, and also having 2.5 year exp in sales and marketing. Now can any one suggest me what should I do for better. The salary level have really increased compared to 2008-2009 times. Also the Demand of market is really increasing for MBA from top business schools. Please tell me average (mba system) colleges in mumbai and pune, Syllabus and salary? All the colleges or Institutes mentioned above conducts full time MBA programs. Executivembainindia.com is our website where professionals with great expertise are always ready to assist and guide you if you are in the hunt for any serious Executive MBA edification. For more information visit http://www.executivembainindia.com.